Looking at this bowl of chili automatically gives me a warm, fuzzy feeling on the inside. And, that’s exactly what I need when the weather gets cold. 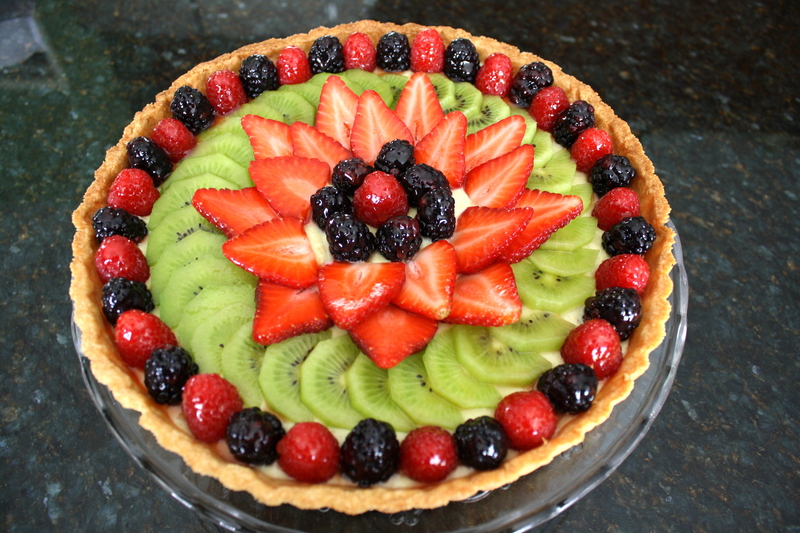 Now that the weather here in Southern California is resembling a bit of autumn, it makes me think of cold-weather foods. One of my favorites is chili. Since our family is also trying to eat healthier, ground turkey is our favorite substitute for ground beef. Brown the ground turkey with some canola oil. Here are the aromatics that give the chili its robust flavor. Dice up the garlic, onion and green bell pepper. Then, saute the vegetables until they are soft. Throw the turkey and vegetables into the crock pot with all the remaining ingredients and allow it to cook for 8 hours on low. 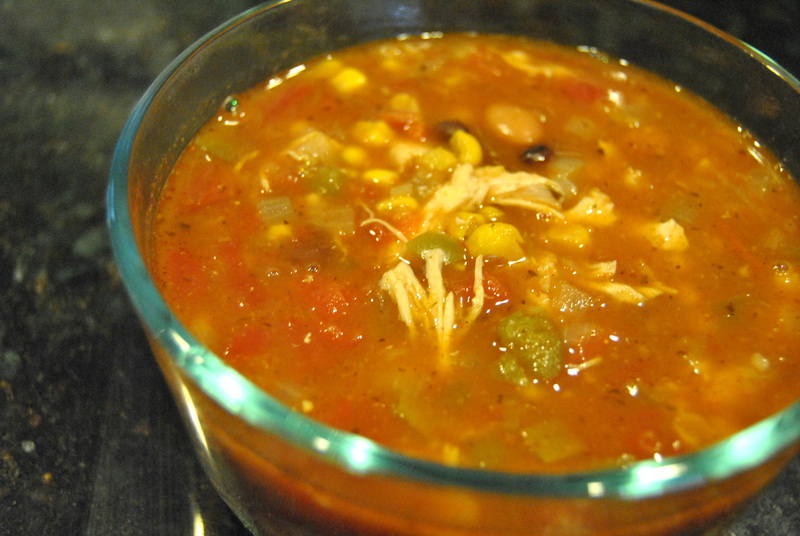 This rich turkey chili takes very little time to make and packs a great punch of flavor from healthy ingredients. Cooking this in your crock pot for 8 hours will fill your house with amazing smells, you may not be able to wait the whole 8 hours. If that’s the case, you can also cook the chili on high for 4 hours. However long you decide to cook this chili, you will be happy with what you get. Brown the ground turkey in a pan, then place the meat into a crock pot. In the same pan, saute onion, bell pepper and garlic, add to the crock pot. Add all the remaining ingredients (except the kidney beans) to the crock pot. Set on low and allow to cook for up to 8 hours. Add kidney beans about one hour before eating. 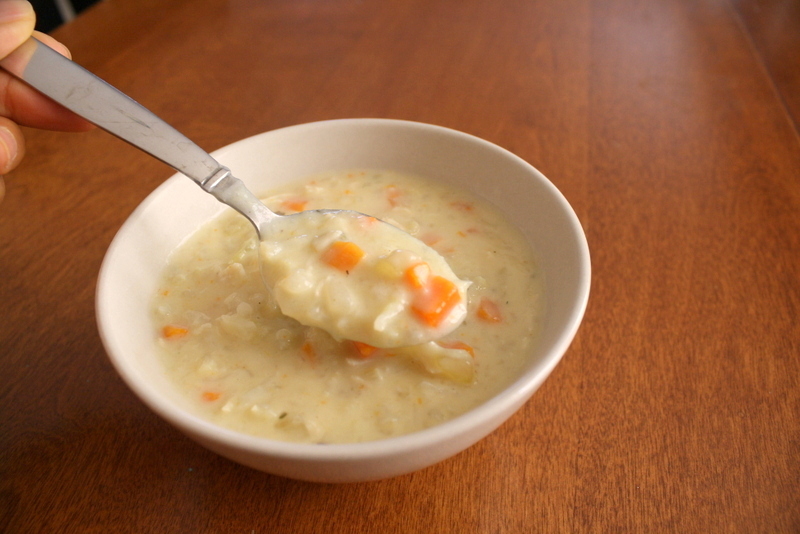 Cauliflower chowder is not one of the more popular chowders out there, but after making this recipe I hope it will be as popular in your home as it is in mine. 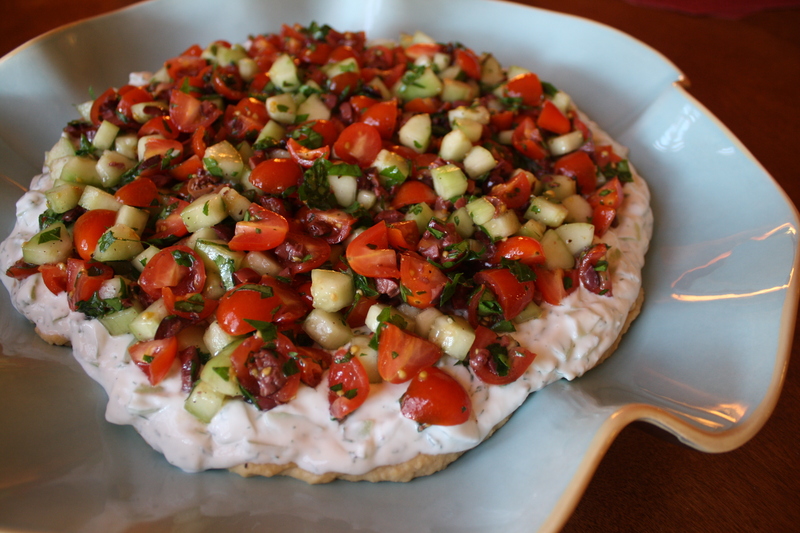 It is really easy to make and is mild flavored but full-bodied at the same time. I love the creamy texture and it’s just so comforting to eat. I know it’s almost summer time, but fast forward 7 or 8 months and imagine a bowl of this hot chowder in your chilly hands as you sit on the couch, watching the rain fall on the windows. Yeah, sounds good huh?! Please don’t wait 8 months to make this though. Make it today, it’s good anytime of year. 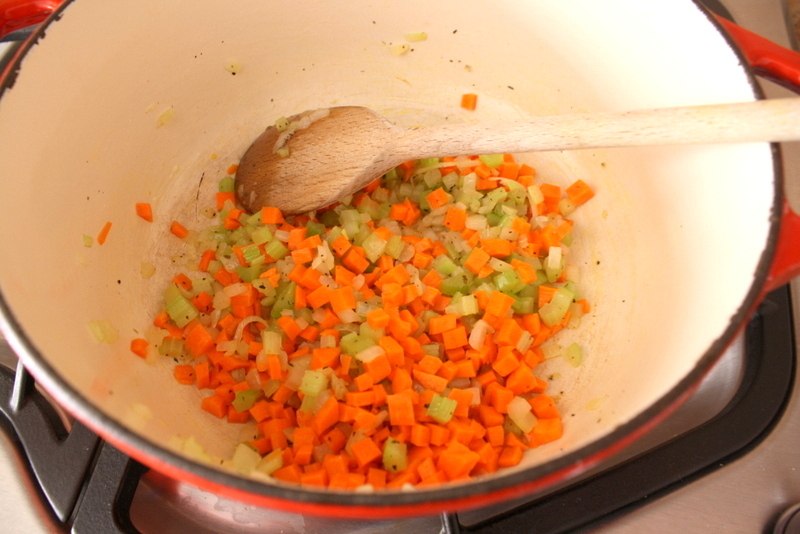 Start by sauteing diced onion, carrots and celery until soft. 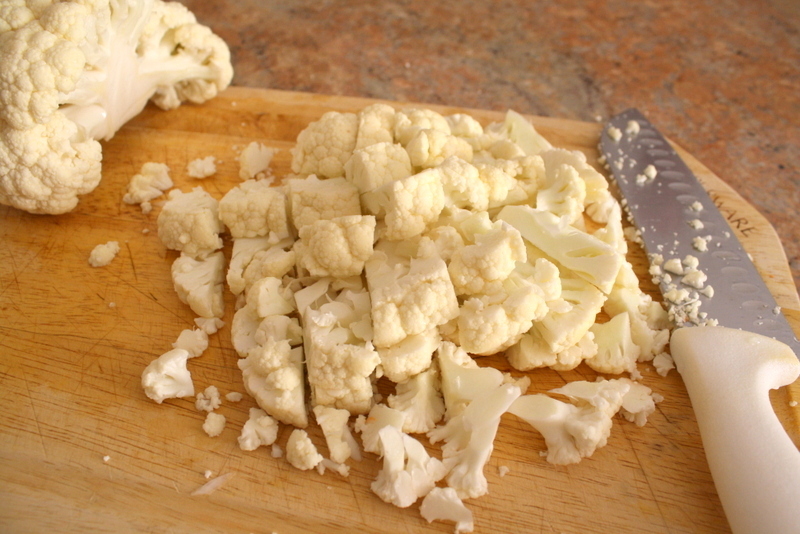 Chop up one head of cauliflower. You don’t need to be super precise, since it all breaks down and crumbles in the soup anyway. Once tender, add in the chicken broth or vegetable broth if you want to stay vegetarian. In a smaller pot, melt butter and add flour to make a roux. Add in half and half once the flour is cooked a bit. 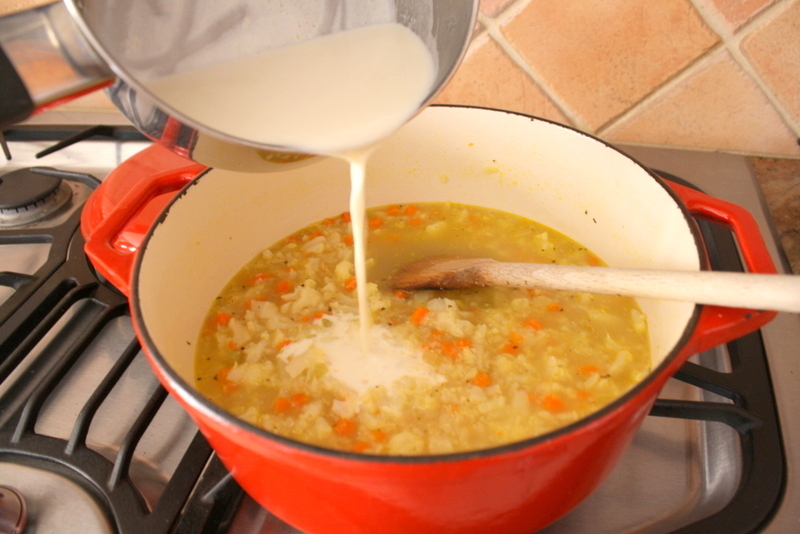 Pour the milky roux into the vegetables and it will thicken as it cooks. Lower the heat to low and cover, stirring every 10 minutes. The chowder is ready to eat now, but will only taste better as it sits longer. To make this into a one pot meal, I like to add chunks of cooked chicken breast. 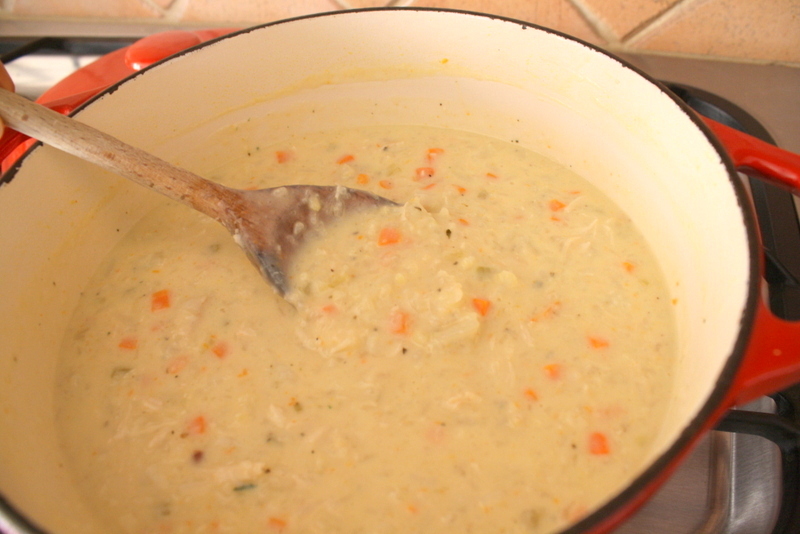 Better yet, buy one of those rotisserie chickens from the grocery store and just add the meat to this chowder. Can’t get much easier than that! The best thing about this soup is that I can actually get my daughter to have vegetables for dinner!! She loves the flavor and texture and doesn’t even realize she’s eating 4 kinds of vegetables with each spoonful. Gotta love it! In a medium saucepan, melt the other 4 tablespoons butter. Add the flour and whisk to combine and cook the flour for one minute. Add the half-and-half to flour mixture and whisk until thickened. Add mixture to the simmering soup. Allow to simmer for 15 to 20 minutes. Check seasoning and add more salt or pepper if necessary. What is the perfect thing to have with a warm Italian panino? 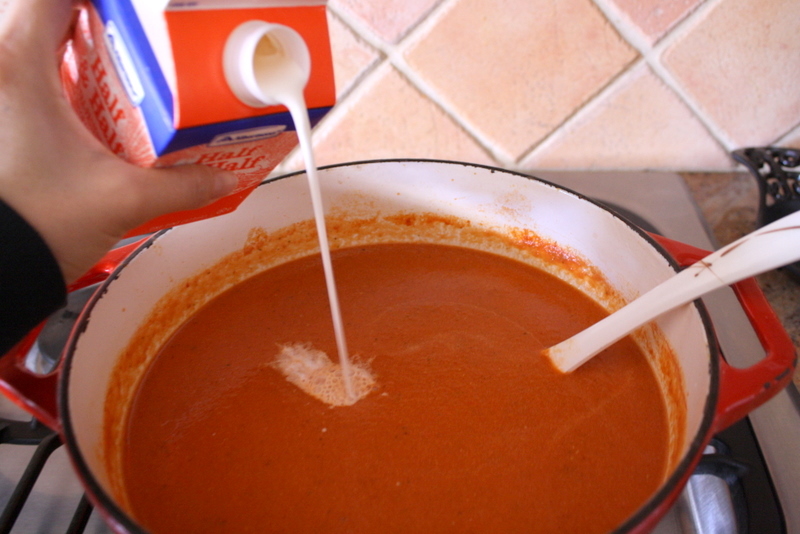 Of course………..tomato soup. But, not just any tomato soup. 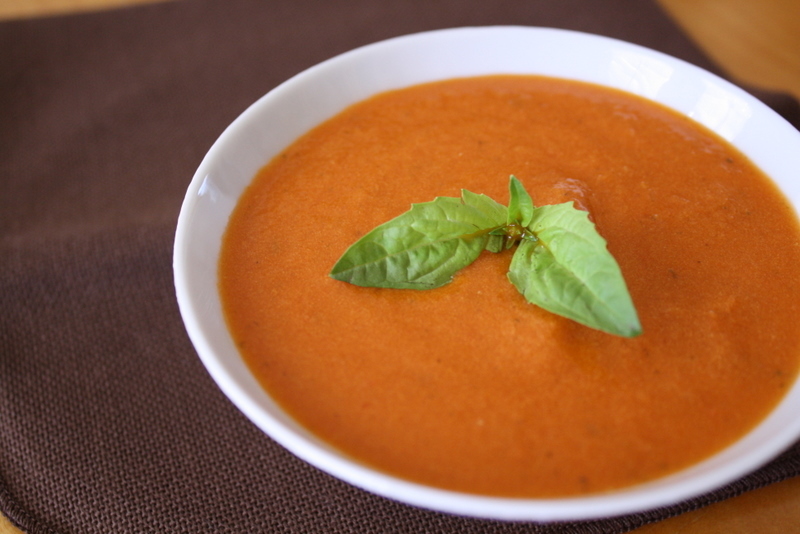 This is creamy tomato and red bell pepper soup with fresh basil. I made this for some of my girlfriends for lunch and it was a nice way to round out the panini sandwiches and fun conversation. The way to start any soup is to begin with aromatics, which adds depth of flavor. That comes from the onions, garlic, dried thyme and tomato paste. Layer in salt and pepper as you go. 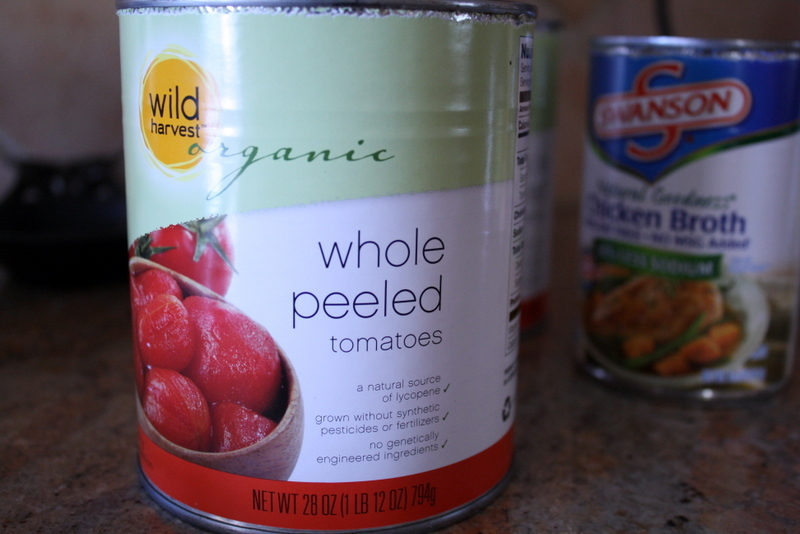 When the onions are soft, add two cans of whole tomatoes. Break up the tomatoes with your wooden spoon and add one can of chicken broth. Let that come to a boil and then cover and simmer on low heat for 30 minutes. Drain the roasted peppers and dump them in. Add in the 10 leaves of chopped fresh basil. Test the soup for salt and pepper and then let it rest for about 10 minutes, to cool. I also added some sugar to tone down the acidity a bit. 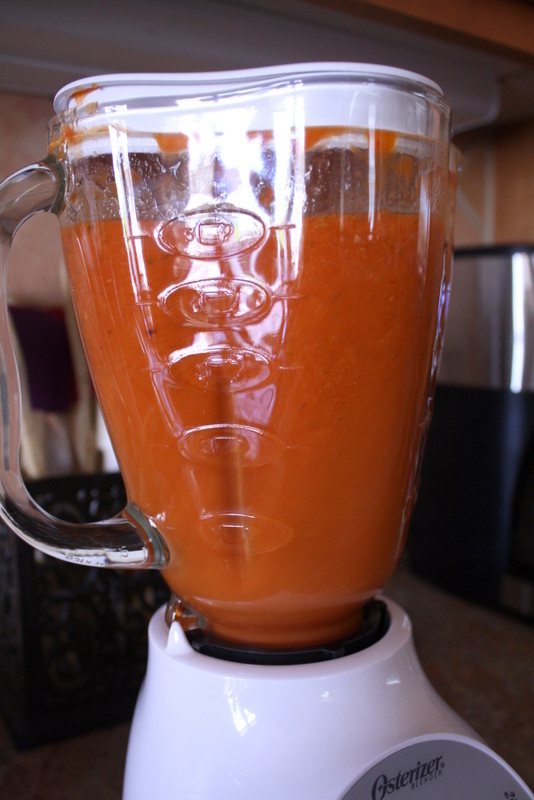 Slowly ladle half a blender full of the soup and let it blend until smooth. Do the same with the remaining soup and dump it all back into the pot. Here’s where the creamy comes in. The half and half just gives the soup a great smooth mouth feel. It also tones down the bite of the tomato. 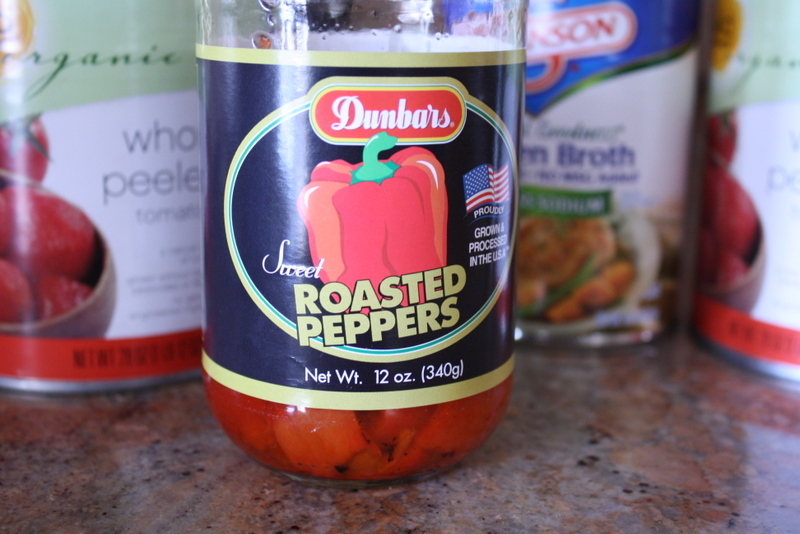 Overall , if you like tomatoes and soup then you will absolutely love the flavor of this soup. And the best part is, I make extra because soup always tastes better the next day! Heat 2 tablespoons olive oil in a heavy pot on medium-high heat. Add onions, garlic, thyme and saute until tender, about 5 minutes. Season with salt and pepper. 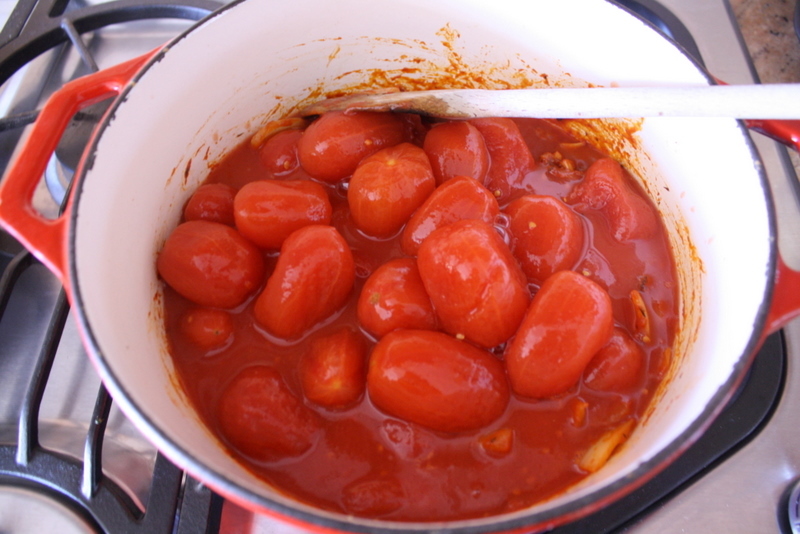 Add tomato paste and cook until incorporated, just 1 more minute. Add tomatoes, red peppers, and chicken broth and let simmer for 30 minutes, until the vegetables are tender and the flavors have melded together. Taste for seasoning and add more salt, pepper, and the sugar, if needed. Add basil, and puree using blender until smooth. Add half-and-half and stir. So, I got tired of the run-of-the-mill red chili. Here’s a chili that caused me to redefine chili altogether. It’s really mild, but full of flavor. It’s made with chicken instead of ground beef. 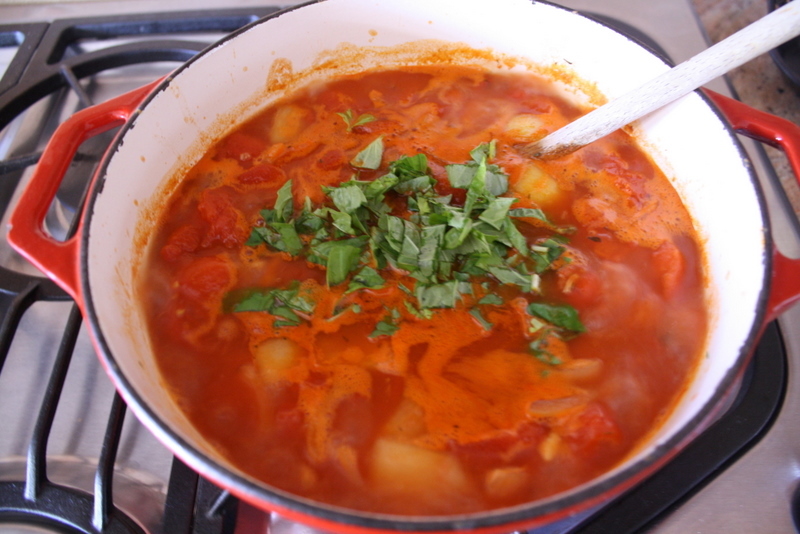 It uses white beans instead of red kidney beans. It’s a nice change from the usual. And, I like change! I got this recipe from my MOPS group cookbook. It was put together by our seasoned moms (older mentor moms) to pass down to us younger moms. The cookbook is filled with treasures that are easy to make and are good for a household of young children with picky palates. This chili was a hit in our house the first time I made it. It doesn’t have the spice and bold flavors of red chili that put preschoolers off. The chunks of lean chicken breast meat and mild white beans are a great source of protein for the little ones too. It does have a small can of diced green chiles, but the little hint of it blends well with the chili as a whole. Add some crunched up tortillas chips on top and you’ve got a quick easy meal fit for any family member, young or old. 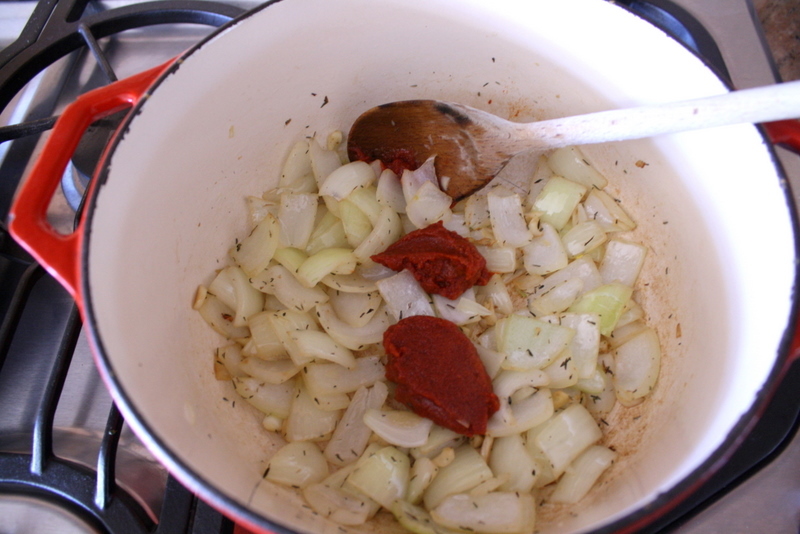 In a large pot, sauté onion until transparent; add garlic and sauté. Add beans, chilies, broth, cooked chicken, cumin, cayenne pepper, salt and pepper. Bring to a boil; reduce heat and cook uncovered at a simmer for 45 minutes. Add cheese and stir constantly until cheese is melted. Remove from heat and add sour cream. 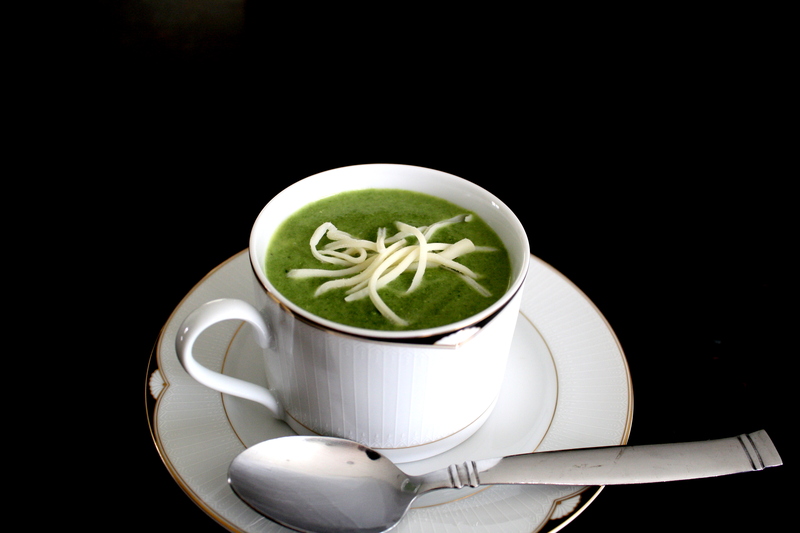 This spinach soup not only packs a lot of nutrients into a small bowl, it also delivers a punch of flavor. I’m not sure about all the vitamins in spinach, but I’m sure there’s a lot. All I know is that it helped Popeye fight Bluto and he always won, so it’s gotta be good for ya’, right? The velvety mouth-feel of this soup makes it so easy to eat (or drink) and I paired it with a crusty Italian panino, which is a wonderful texture contrast. The cayenne pepper really wakes up your palette. The next time you want to serve a simple but elegant soup, try this. Or, the next time it’s a busy weeknight and you want something flavorful and easy, try this…………right out of the pot! When you scroll down to the bottom of this post and see the recipe to this soup, you’ll know why I love making this for my family on a busy week night. One-third of the ingredients come out of a can! Don’t get me wrong, I am still cooking here. There is still baking, chopping and sauteing going on. 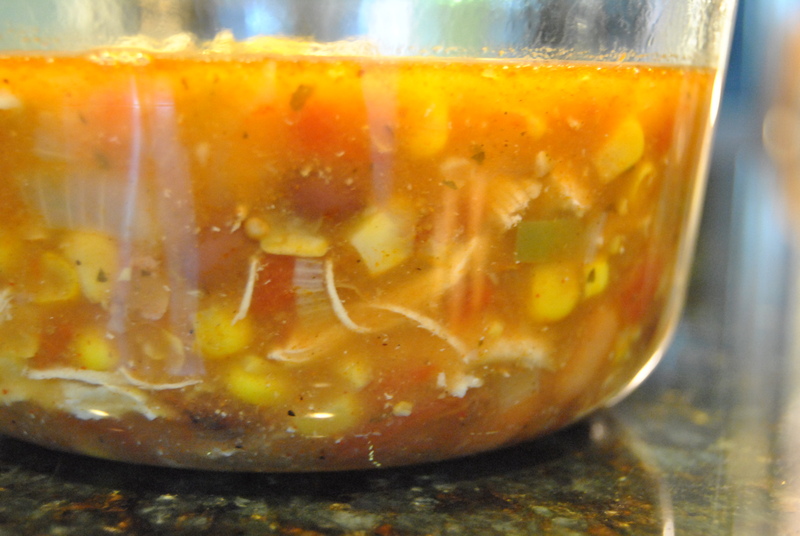 You will be amazed at how much flavor develops from this soup in only one hour of cooking. Soups always taste better the next day, but this one is pretty darn tasty, piping hot the same night. I must apologize for this bowl that I took the picture of the soup in. I got so excited to eat and the family was hungry, so it didn’t occur to me to take the photo until I spooned the soup into this glass bowl for my hubby’s leftover lunch the next day. The nice thing about the glass bowl is that I can you see all the ingredients swimming around in there, playing nice with each other. Aren’t they cute? By the way, my hubby did confirm……….the soup tasted even better the next day! Place chicken on a baking pan and sprinkle with olive oil, salt and pepper. Put in the oven at 350 degrees F for about 30 minutes or until cooked. When cooled, shred the chicken and set aside. Add olive oil to a stock pot and sauté onion, bell pepper, and garlic until soft. Add in all the remaining ingredients and stir. Allow it to come to a boil and turn down to medium heat and cover for 30 minutes. Add in the shredded chicken and cook for another 30 minutes. 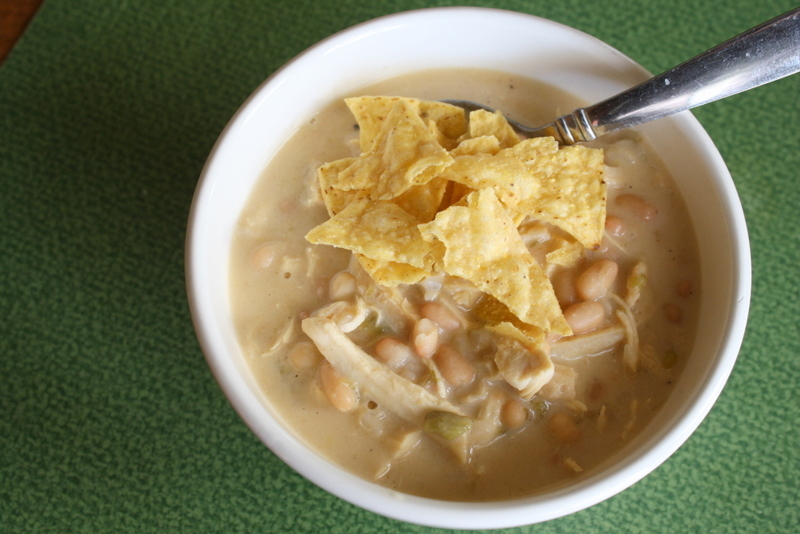 Enjoy soup hot with tortilla chips and toppings such as sour cream, avocados and shredded cheddar cheese. 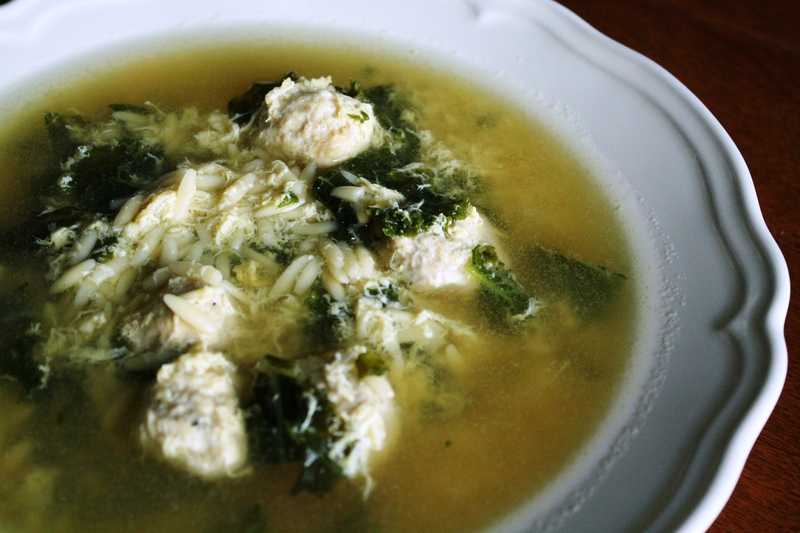 There is nothing better than a really yummy bowl of soup to perk me up on a rainy day. If you’ve been anywhere near a television and have been watching the news about the horrible rain and flooding we’ve been having in Southern California, you’ll know that this weather definitely calls for a good soup! I know soup won’t stop the rain or flood, but it may put you in a better mood to deal with it all……..just a thought! Not only is this soup tasty, it’s also pretty healthful too. The meatballs are made from ground turkey and the leafy greens are packed with vitamins too. The orzo is just fun to eat and I can always use a little fun……….can’t you?! To make the meatballs: Mix together all the meatball ingredients. Shape the mixture into 1-inch-diameter meatballs. Place on a baking sheet, drizzle some olive oil over the meatballs and bake at 350 degrees F for 15 minutes. To make the soup: Bring the broth to a boil in a large pot over medium-high heat. Add the meatballs and cook the kale until tender, about 8 minutes. Whisk the eggs and cheese in a medium bowl to blend. Stir the soup in a circular motion. Gradually drizzle the egg mixture into the moving broth, stirring gently with a fork to form thin strands of egg, about 1 minute. Put in the orzo pasta and cook until pasta is done. Season the soup to taste with salt and pepper. I haven’t met a chowder I didn’t like. That includes this one. I mean, what’s not to like………….bacon, potatoes, heavy cream! Have I said enough?! I must admit, this clam chowder is more brothy than your usual chowders. I like it this way because the ingredients are already very rich in flavor. I don’t want the texture to be too heavy. I actually had to drink up some of the broth to get this shot of all the good stuff in this chowder. That, and it gave me an excuse to eat more than I needed! 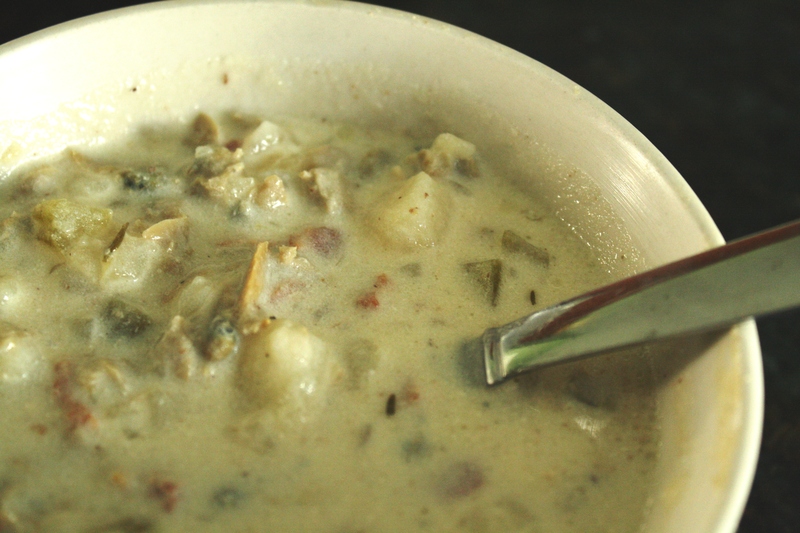 The next cold day we have, try this chowder and I’m sure it will warm you up quick! In a large heavy pot cook the bacon until crisp and the fat is rendered. Pour off all bacon fat except 2 tablespoons. Add the butter, onions and celery and cook until softened, about 5 minutes. Add the garlic, thyme and bay leaves, and cook until the vegetables are thoroughly wilted (about 3 minutes) being careful not to brown. Add the potatoes, clam broth and water, and bring to a boil. Lower the heat, cover, and simmer for 20 to 30 minutes, or until the broth thickens slightly and the potatoes are very tender. (If you like a thicker broth, mash some of the potatoes against the side of the pot with a wooden spoon.) Remove from the heat, stir in clams and heavy cream and season with pepper and salt, if necessary. 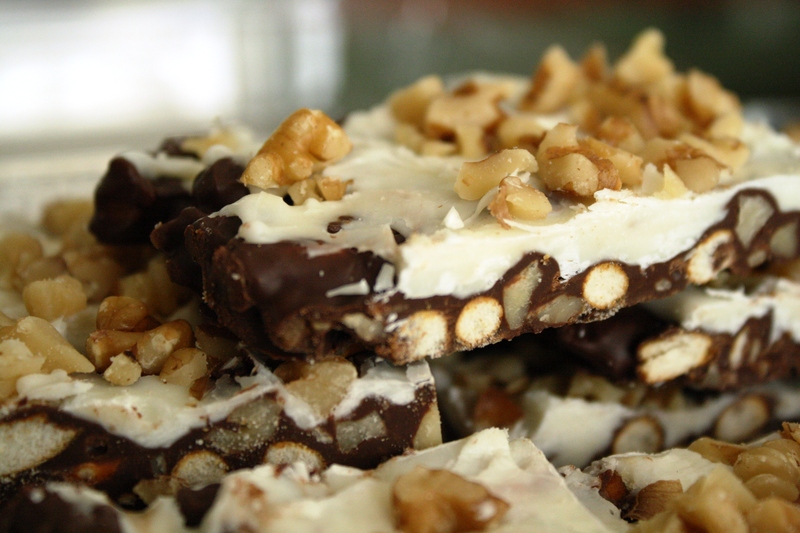 Set aside for 1 hour, covered, to allow the flavors to marry. Place the pot over low heat, and slowly reheat, being careful not to bring to the boil. Be sure to remove the bay leaves and sprigs of thyme before serving. One of my favorite vegetables is corn and my favorite type of soup is chowder. 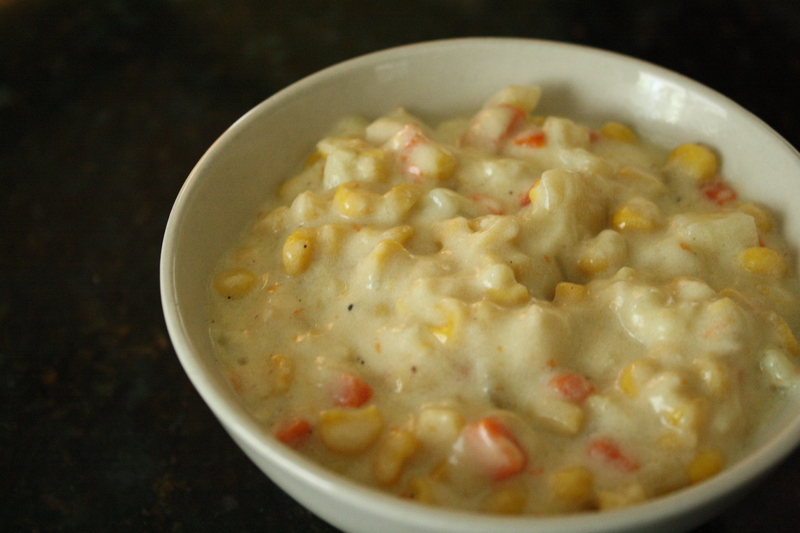 This chicken corn chowder definitely brings together the best of both worlds. I will take a chowder over chicken noodle soup any day of the week. I like the stick-to-your-ribs kind of chowders and stews. I think the cold weather really brings that out in me. The chowder provides a wonderful balance of sweet and savory, smoothness and crunch. It is definitely a hearty soup and a bowl of this is enough for a meal. I took this picture the day after I made the chowder, so it had thickened quite a bit. It was easily remedied with some extra chicken broth, but I like my chowder a bit chunky. Some chowders can be very high in fat and calories, so I used fat free half-and-half instead of heavy cream and you wouldn’t even know it. What’s better than guilt-free chowder? Melt butter and olive oil in large pot. Add onion, carrots, celery and garlic and sauté for 2 minutes. Add flour and stir to make a roux. Cook until roux is lightly browned; set aside. Combine corn and chicken in another pot and bring to a boil. Pour the broth and corn (a little at a time) into the roux and whisk so it doesn’t create lumps. Return pot to the heat and bring to a boil. Add potatoes and chicken. Mixture should be very thick. Pour the half-and-half into the corn mixture. Add nutmeg, salt and pepper to taste. Cook until potatoes are tender, stirring occasionally. 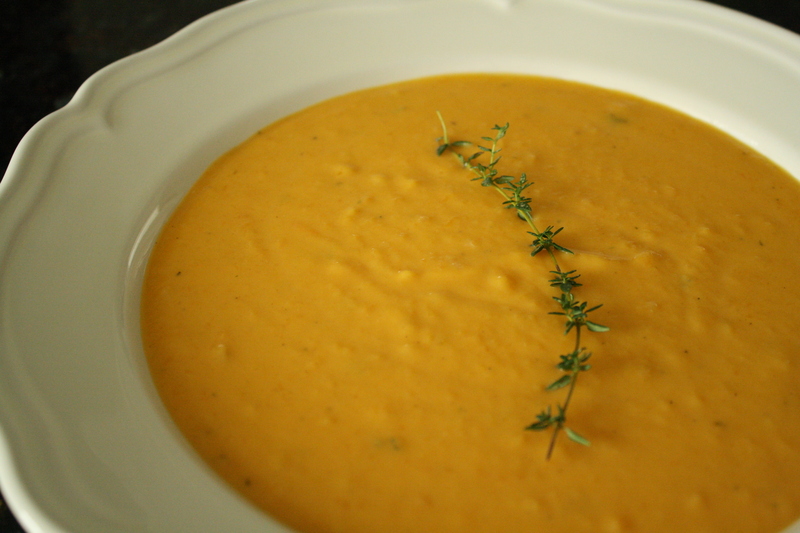 This is the a perfect soup for the cool autumn weather………..we should be having. In my town, we are experiencing temperatures in the 80’s, no joke! I know, it’s so wrong. Even though the calendar says autumn, the weather says summer. But, I say “soup!” I wait for the cool weather all year, just so I can make soup and by golly, I did. 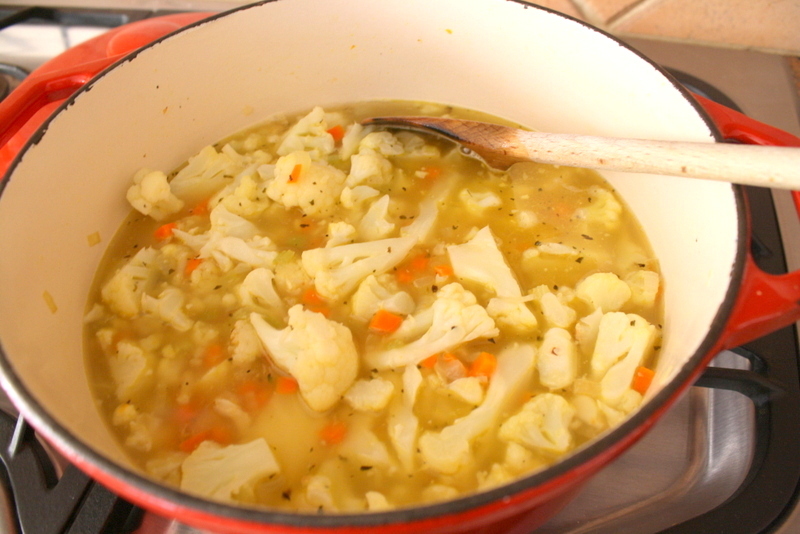 Regardless of the weather, this soup is still very tasty and simply easy to make. It took me a long time to reach out and buy a butternut squash. It just looks kind of odd and I was unsure of the flavor, but my fears were calmed after I had this soup for the first time. It is velvety in your mouth and the pops of curry and thyme keep it interesting. I also just love the color, like autumn in a bowl! Melt butter in a large soup pot over medium heat. Stir in the onion, garlic, ginger, curry powder, thyme, bay leaves and salt. Cook and stir until the onion is soft, about 10 minutes. Cut squash in half lengthwise; discard seeds and membrane. Cut into cubes and add to pot. Pour the chicken broth into the pot, and bring to a boil. Cover and cook an about 30 minutes. 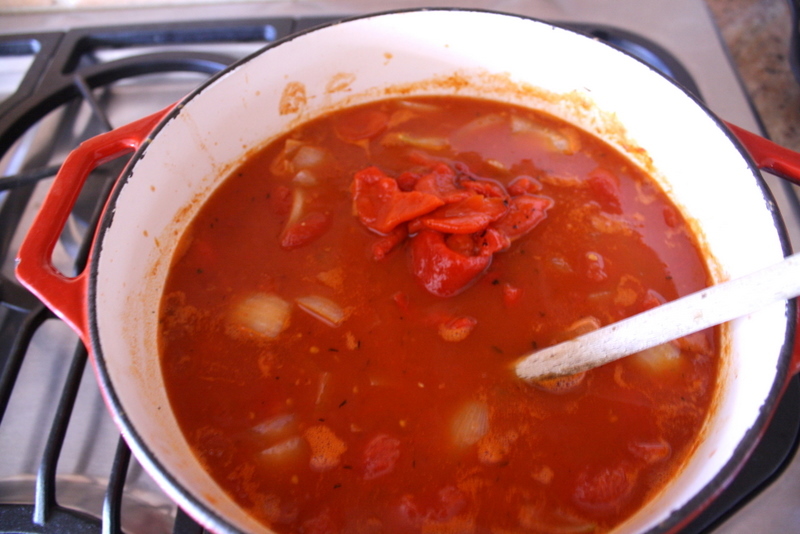 Remove the bay leaves and ladle the soup into a blender, filling the pitcher no more than halfway full. Remove the small cover insert from your blender lid and hold down the lid with a folded kitchen towel, and carefully start the blender. Puree in batches until smooth. Return the soup to the pot, stir in the half and half, and reheat. For garnish, drizzle half and half with sprinkle of thyme leaves on top of soup.